For something different you really have to go to Waaghals in Amsterdam! Waaghals is the Dutch translation of daredevil so get inspired by many creative dishes. A classic meal or a varied combination, all the dishes are prepared with the best organic products. If you are a vegetarian you definitely should go to this lovely place! Very good dishes, interesting and original recipes. Definitely a lovely places for vegetarians. The staff was also very nice. Prettige , attente bediening en echt lekker eten, ook qua hoeveelheid. Best meal we’ve had in Amsterdam. Vegan and vegetarian food, inventive combos, beautifully presented and delicious. Had the 31€ 3 course meal option. 4 choices each of appetizer, main and dessert. We’ll return if ever in Amsterdam again. Really good! Had a nice time with gf. It was a bit expensive, but well, it's amsterdam. The staff was friendly, the atmosphere was nice but those lights were a bit too strong. I like dimmer tones. Food was great but ventilation can be improved. Good tasty food and great service. Fantastic food, one of the best vegetarian meals I have had! The taste and presentation was wonderful, I would recommend this restaurant to meat eaters if they are thinking of going vegetarian! 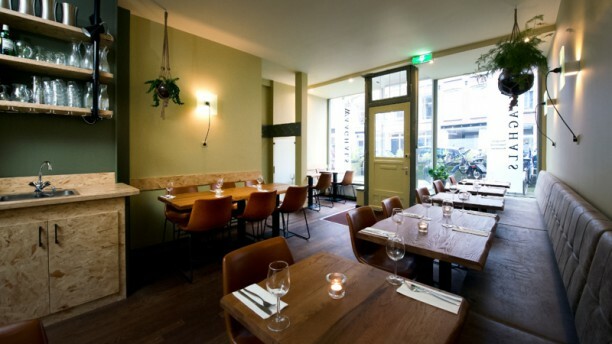 Best vegetarian food in Amsterdam! Yum, Yum, Yum, Yum, Yum, Yum, Yum, Yum, Yum,! Yum, Yum, Yum, Yum, Yum, Yum, Yum, Yum, Yum, Yum, Yum, Yum, Yum, Yum, Yum, Yum, Yum, Yum, Yum, Yum, Yum, Yum, Yum, ! One of the best organic vegetarian restaurants I've ever been to. Really creative and incredibly tasty. Real value for money. Not too many tourist, here, what adds up to the great experience. Excellent creative menu with a wide choice of vegetarian and vegan options. The presentation was superb. Interesting food combinations. Consistently high quality from starters to mains and desserts. Good wine selection, loved the Le Canon du Maréchal. Nice and innovative cuisine with organic and very good quality food. Surprising combination of different flavours. Cordial staff and lovely position. Recommended. Very nice service, high quality of food, very nice neighborhood. Recommended as well to meatlovers. The restaurant has as well a lot of vegan options. Een absolute aanrader voor vegetariërs, flexitariërs en vleesetenden!